The steam is not dry. When I showed it to KillerQueen who came to inspect my place around late May, he was not impressed with the quality, or the attachments that came with it. I am not sure why it's being advertised as the best steamer to get to deal with this problem. My question is, how can it be advertised as Dry steam, when it's really not? Maybe someone out there can prove me wrong, in fact, I hope someone can, as I spent $300 and now own one. Sorry you are having a bad experience with this steamer. The short answer as to why the site is advertising the Vapamore is that a lot of people here have used it and recommended it,* which is why it is recommended in the Steamer FAQ, along with the pricier White Wing, Ladybug, Amerivap and Reliable models. 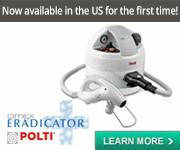 It is popular because it is under $300, which is a low price for a dry vapor steamer. There will probably be better steamers, but they can be a lot more expensive. The Vapamore does have a higher temperature than other steamers in the $300--400 price range, and good pressure, and it operates for 50 minutes. Again, not having used the steamer, perhaps others will have more to say about this. Have you had a chance to compare the steam produced by the Vapamore with that of other dry vapor steamers? I actually have the Vapamore next to my desk and I'm supposed to be taking a look at it along with a bunch of other products. Initial responses from our team in the field is that they are content with it. It's not the quality of some of the others we use but you pay a lot less for it so it all works out. Dry steam is a misleading term. I wish the steam industry would do away with it. Steam is water. Saying dry steam is like saying quiet noise or soft rock. It doesn't make any sense. I agree with Queen assessment that it doesn't have the greatest attachments and it isn't the highest quality but it's all about price point. I bought a Shark steamer floor mop for $90 and my guess is that it works as well as the Vapamore. It is not a dry steamer but it doesn't leave behind lots of water either. A good buy, and maybe a better cheap alternative for folks who can't spring $600 for the White Wing. I have done my unsealed wood floors with it and while i wouldn't do this repeatedly, once in awhile hasn't been problematic. But I imagine on carpets, furniture, etc. the Shark gets to the temps needed to fry them as it after all reaches boiling. It would be cumbersom to use on furniture though as it has no attachments but where there is a will there is a way. I guess you're right...there really is no such thing as dry steam, and I have not had a chance to compare to any other models. I just assumed that what would shoot out of it would be super hot dry air. My exterminator last year told me to use the nozzle on my couch to eject a full force blast of steam. Killerqueen said that should not be done--he said to take a towel and rubber band it on one of the triangular attachments and then each square foot needs to have the steam applied to it for a minute, and move slowly. Yikes! Does this really work? I always worry that the bed bugs will just burrow deeper into the wooden frame of the couch/overstuffed chair or just scurry away as the steam hits them. 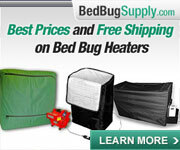 I wish NYC had a bed bug furniture sauna like in Vancouver. I have the Vapamore, and some of the plastic is a little flimsy. but the thing works, it has been used to kill bugs, clean furniture, and in conjunction with a carpet cleaner to clean the rugs. When I did the couch, I went over the couch several times in a row, each time trying to get deeper into the couch. The first time was with low pressure and the carpet adapter, trying to get the most surface bugs without blowing any of the live bugs around. The next pass was with the carpet accessory but high pressure, trying to get bugs further in the cracks. I figured that at that pressure, any bugs I blew around were those that had been killed on the first pass. Then two passes with the nozzle, the first with low pressure, then a high pressure pass. DE was dusted in the cracks, around the cushions, and in any opening I could reach. A week later I repeated the whole process, and then again yet another week and another steaming. Along the way, I built up steam in the steamer and then threw the circuit breaker to turn off power in that room. Using the steamer with a towel to reduce moisture, I cleaned out the electrical panels behind the couch. I then used an extension cord from another room to power a fan to quickly dry the outlets, then sprayed bedlam in the outlets, waited for the bedlam to dry, and puffed both DE and Boric Acid into the wall around the outlet (The Boric acid is for the benefit of cockroaches, termites, ants, fleas, silverfish, and other little nasties that I do not want around). De-bugging the electrical outlets was a requirement, since I found a small nest in a crack behind on of the plates. If anyone uses steam or spray around electrical outlets, make sure that the power is off and that the outlet is dry before turning back on. After the third week, I applied Bedlam to kill any stragglers. When the weather hit 90 degrees, the steam retained the heat well into the fabric (There are places I could steam and see the steam come back out of a different area). And everything dries quickly so that I didn't worry about mold from the moisture. It has been two weeks with no sign of bed bug life. 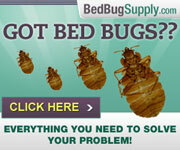 Anyone who reads this ... DO NOT DO ANYTHING That death to bed bugs did. I know some have to do self treating .... But under no circumstances should you steam electrical outlets, powered on or off. And never spray liquid chemical inside as well. 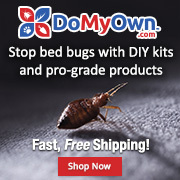 I wanted to post in response to this thread and hopefully answer some of the questions about steamers in general and using them for bedbug removal. Fist is the statement about our steamer, the Vapamore being wet steam and not dry steam. In the industry steamers are referred to as dry vapor steamers but the one thing to keep in mind is steam is water, all steamers put out moisture and water buildup. When using our steamer or any steamer the thing to remember is when you first get ready to use it after its heated up and ready to go is to purge the water from the lines. When the steamer heats up and in between using the steamer water will build up in the lines from the steam returning back to water. Purging the machine before using it on your application will prevent this large amount of water coming out and on to your work area. The Vapamore was designed to be a quality consumer level machine that has a quality company and customer service program behind it so you end up with a machine that can be used for years and years instead of a disposable machine that cant be fixed or you cant get parts for like so many of the cheap machines on the market today. One other item with using steamers on mattresses is to make sure the mattress is 100% dry before installing a plastic mattress cover that many people use to help prevent bedbugs. If you apply the cover to a moist mattress you can have mold and mildew issues. Just give it time to air dry completely before installing any covers. Steam cleaners aren't for everyone and we understand that there can be questions and comments that need to be addressed. I hope this helps on some of the questions and as always we are here to help and support in any way we can. I recently purchased a Vapamore MR100 and recommend it conditionally. Yes, the plastic attachments seem a bit flimsy. Yes, some of the attachments seem to fly off from steam pressure if you're not careful and this can be annoying. No, I would never in a hundred years buy this machine if I was a PCO, or even if planning on using it in my home on a weekly basis. That said, I bought this machine for a very specific reason and that was because of a possible bed bug infestation. I've used it three times already for that purpose, and once to clean the bathroom and kitchen. Frankly, these steamers are a lot more work than the videos suggest (makes vacuuming seem like fun ) And I assume that this is with all steamers -- you don't fly through rooms, you go through them very slowly -- so once my bed bug issue is resolved I doubt if I'll use the steamer more than once every month or so. Probably a lot less. But then again, house cleaning was something I usually left to others. Until now. Uggh! So again, if you plan on using this thing on a daily or even weekly basis for many years, probably not for you. 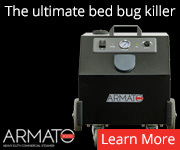 But, if you want this primarily for bed bugs, and maybe on a very occasional basis afterwards -- or if spending upwards of a $1000 on a cleaning unit doesn't make sense -- then you should consider this unit. 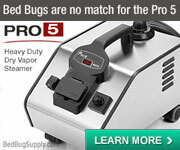 On the other hand, if price is no object, the LadyBug and some of the other pro units look really nice. Guys ... a very good and pro quality machine is a Vapor Clean TR5. It can be found for under 500.00 and will serve you really well. Its more then the above mentioned unit but if you can afford the additional cost, it will not disappoint. Most of the machines you fine online are way over priced for options and marketing you don't need to pay for. The lady bug is nothing special with a large price tag. If you look at the TR5 or the TR6 these machines will give you the most bang for the buck. I use the TR6 just about everyday .. and it rocks! The machine the original posted mentioned is for light or occasional use so keep that in mind. I'm sure it will workout for many people who are looking to do steam work . But check out the TR5 if anyone needs or wants a new machine. Note: I don't have any connection with this company at all. I just ordered the TR5 from Vapor Clean (looks like they were out of the TR6, which is more expensive and more heavy duty than what I need anyway). I'll let everyone know how it works out. I plan on steaming - well, having my boyfriend steam - everything in the freakin' house. I'm not using Vapamore, because I'm in Italy. I realize it depends on how long you steam the mattress and how thick it is, etc etc, but just generally, for some idea - how long do you think you'd have to air out a mattress indoors after steaming it, before encasing it? No. BBs are not inside the mattress, so you have to steam only seams, tufts and everywere BBs are harbouraging. but just generally, for some idea - how long do you think you'd have to air out a mattress indoors after steaming it, before encasing it? Dry steam certainly sounds like an oxymoron. The humidity in NY these past few days makes the record-breaking summer heat feel like nothing. If it's humid in your place then it's humid. 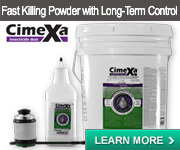 Might it be simple common sense to not seal anything during high humidity? Is 'dry' steam even relevant then? It is so humid the little bit of DE I have spread around is caking up--so I'm not spreading anymore until the humidity lightens up. Do people really need to spend 300 bucks on a steamer? Why, for e.g., wouldn't a cheapo little steamer (such as a travel de-wrinkler) be a waste of time for the home user, if it is? I have a cheapo little steamer and now have a Vapamore. I can't speak about bedbugs. But I wear long skirts and my Vapamore makes much shorter work of de-wrinkling than the cheapo steamer and the fabric feels hot to the hand. With the little steamer, the surface was still cool and I was even able to "steam" my hand. 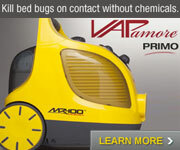 Steaming bed bugs is about raising their core temps really really quickly. A blast of super-heated steam from a proper steamer can do in a few seconds what a little steamer can't. On the other hand I might have really drawn the short straw with the little steamer. Has anyone measured what the temps are from the Vapamore steamer? I have, and I don't remember what the temps were (it was months ago), but it was above 120 F right under the nozzle. Am disappointed with my Vapamore this morning! There is a red light to say it is heating up and a green light to say it's fully heated. The manual says it will take about 11 minutes to heat up the first time - fine. The problem is that the green light goes off every 10-15 seconds!!! That means in order to be sure the temps are high enough to kill eggs on contact, I am constantly staring at the lights while steaming. So I steam 10-15 inches of mattress (or floor, or whatever) while starting at the light, then the green light goes off, so I stand there waiting a while for the green light to go back on. It's taking at least twice as long, does NOT steam *at full temp* for 50 minutes continuously, and is giving me a crick in my neck because I'm turning around to stare at the lights. This is the second hour I'm using it this morning (used it for 45 minutes, let it rest for 15, then started using it again) and I had to re-do everything I did in the first 45 minutes since I hadn't realized I needed to keep an eye on the light. Hm, big disappointment! Have done a bit more research since my last post...I guess this is my fault for not researching steamers a bit better and getting one with continuous steam. Just wanted to dive in and steam everything I could asap! Also, ordered from usbedbugs.com which I love because they have amazingly fast shipping. I also love usbedbugs.com because they don't accept returns, so I know everything I'm getting is pristine. However, now, because of the return policy I used to love, I'm now stuck with this non-continuous flow steamer. Hrmph. Am disappointed with my Vapamore this morning! There is a red light to say it is heating up and a green light to say it's fully heated. also regarding the lights going on and off again . . . I sprayed a live bug with steam recently, before my steamer suddenly crapped out entirely --and he sort of paused then kept walking. I am questioning the steam temperature.